iPad’s rich library of apps and features have given today’s hotel guests more ways to connect to products and services offered during their stay. 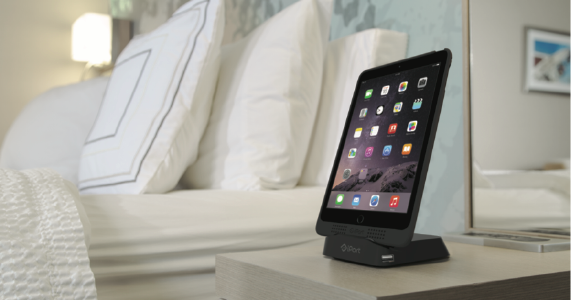 iPort’s LaunchPort, Charge Case, and Surface Mount products keep iPads protected and always charged in hotel rooms, making it a pleasure for guests and hotel staff alike to use iPads as the new way to connect guests to a memorable hotel experience. Contact us for full terms and conditions and a quote individually tailored to your needs. The Charge Case & Stand system consists of a sleek protective case that rests and wirelessly charges on a Stand. 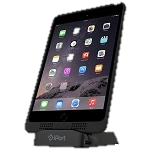 The Stand uses magnets to automatically align the Case for fast and secure mounting ensuring iPad is charged. 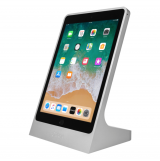 The Stand features USB charging ports for your guests and can hold the iPad in either portrait or landscape orientations. Using a clever combination of magnets and conductive charging, the Charge Case precisely mounts into place on the Charge Stand and begins charging immediately in either portrait or landscape orientations. Plugging in wires is now a thing of the past. Charge Case protects iPad from the bustle of travel and the accidental drop or nudge, all in an elegant and thin case sporting a soft-touch finish that feels great in your hands. Turn iPad into a smart touch controller with Surface Mount: the elegant frame that allows you to integrate iPad onto any surface. Surface Mount’s Aluminum bezel is made of highgrade alloy and finished to the highest standards. Choose from 3 finishes: Black, White or Silver. The result is a bezel as refined as the iPad itself. Surface Mount’s electronics system can receive power from a PoE Switch or 24V DC power supply. When power from a wall receptacle is required, just use the Power Injector. The LaunchPort system consists of a Sleeve and any number of Stations. A Sleeve is a protective case that fits onto your iPad. A Station is the mount and charging unit that connects to and holds a Sleeve. There are two types of Stations, one for the table and one for the wall. LaunchPort powers iPad via inductive charging. As soon as a Sleeve is mounted to a Station charging begins immediately, without wires or cables. Magnets are used to mount and hold an iPad-inSleeve to a Station. Protect iPad with the Ruggedized Sleeve designed for the rigors of any kitchen or back of house operations. The Ruggedized case features integrated loop holes for carrying iPad where you go and a convenient pen compartment for storing Apple Pencil. LuxePort Aluminum Cases, WallStations and BaseStations are made of high grade alloy, precision machined and finished by hand. LuxePort has expanded powering options. WallStations have the ability to receive power from via PoE or Low Voltage wiring. LuxePort creates a home for your iPad so you always know where it is, keeping iPad always charged and always ready. The most elegant way to enclose and mount iPad to any surface with the option for hardwired power and data for professional applications. Table Mount can be installed on a table top of mounted on the vertical surface of a wall for kiosk application. Security locks keep Table Mount secure in high traffic spaces. All power and wiring components are hidden in the base for a sleek, elegant look and feel.